To filter your diagrams, click on the drop-down menu to the top right of your ‘Existing Diagrams’ panel (located below your 'Most-Recently Modified Diagrams') that begins with ‘Showing…’ By default, ‘Showing All Diagrams’ will be the filter selected. From here, you will have the option to filter all of your existing diagrams by their Diagram Type. To filter your diagrams, click on the drop-down menu to the top right of your ‘Existing Diagrams’ panel (located below your ‘Most-Recently Modified Diagrams’) that begins with ‘Showing…’ By default, ‘Showing All Diagrams’ will be the filter selected. 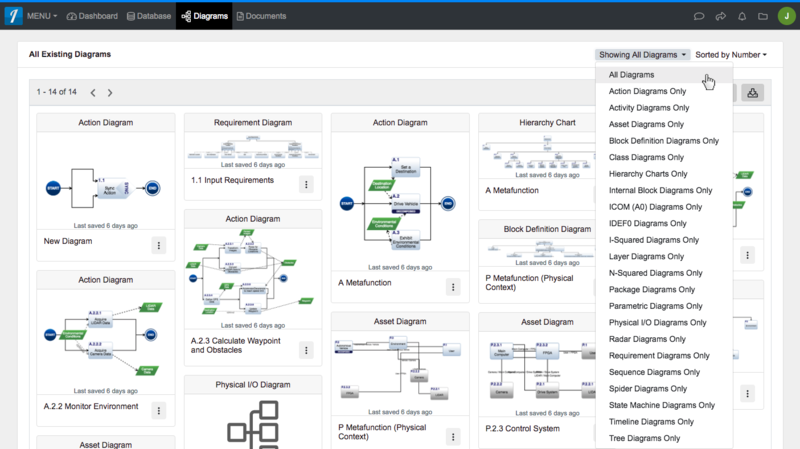 From here, you will have the option to filter all of your existing diagrams by their Diagram Type.